QUINOA, DEHYDRATED VEGETABLES (CARROT, BELL PEPPER, GARLIC, ONION, LEEK, CHIVE) DEHYDRATED BLACK BEANS, YEAST EXTRACT (NATURAL FLAVOUR), FREEZE DRIED CORN, TOMATO POWDER, SUGAR, SPICES, MUSHROOM POWDER, POTATO STARCH, SALT. Quinoa Quickies are all-in-one-pot quinoa side-dishes, flavoured and ready for the plate within 15 minutes. With six varieties, all gluten free, they can accompany almost any protein and accommodate a growing number of people avoiding gluten in their diet. Quinoa is a grain-like crop that is closely related to the spinach and beet family. Growing in popularity, quinoa has been around for 4,000 years as a food source in South America but only recently has been introduced to the rest of the world. The quinoa seed closely resembles rice and offers a similar texture and flavour, however in comparison to rice, quinoa is much higher in protein and fiber and supports a much greater nutritional profile, therefore making it popular amongst dieticians. Top Tier Foods Inc. was founded in Vancouver by Blair Bullus and is currently the company behind Quinoa Quickies. Frustrated with the nutritional qualities of most of the ready-to-eat products on the marketplace, the goal of Top Tier Foods is to make healthy and delicious meal ideas that are simple to prepare and easily accessible to the general public. 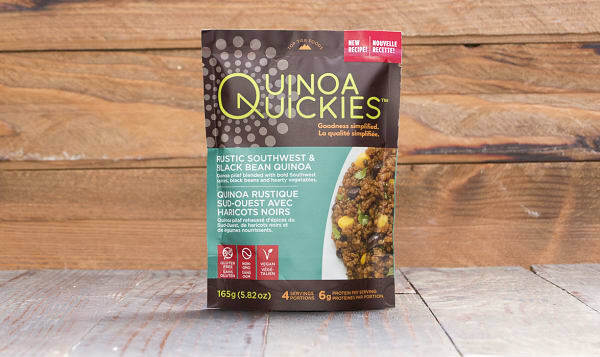 The Quinoa Quickies brand uses these founding qualities as the backbone of the product line in making high-quality and nutritional side dishes that are as easy to prepare as rice. Care and attention was paid in sourcing the best ingredients possible, selecting only high-quality gluten-free products, including organic royal white quinoa. At Top Tier Foods we make sure our products are produced in a responsible way so that you and your family can be sure that what you put on your table is of the best possible quality and nutrition.